Just in time for Mother’s Day, let’s celebrate with a delicious-soundingSlow Cooker Slow Cooker Banana Bread Cake with Brown Sugar Sauce. This would be perfect to make in the Casserole Crock, but use a large oval slow cooker if that’s what you have! Click here to see The BEST Instant Pot or Pressure Cooker Cheesecake Recipes! Slow Cooker desserts are so great because they free you up to do other things while the dessert is “baking” in the Slow Cooker! 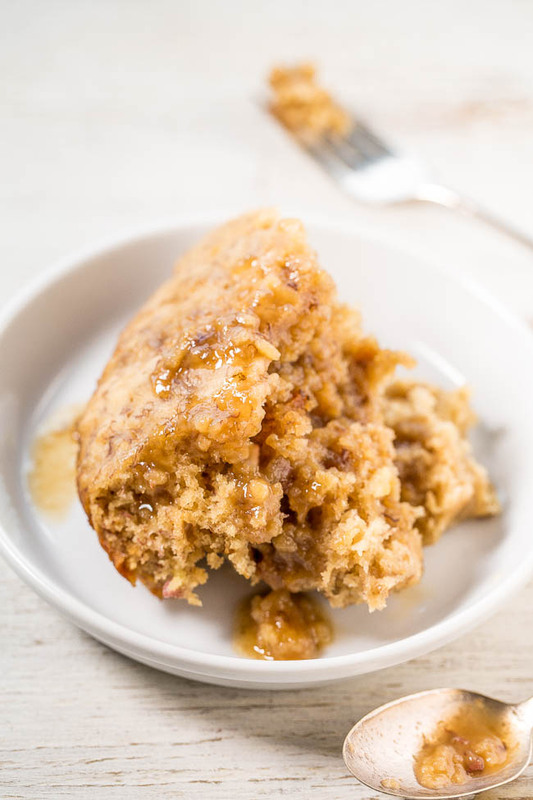 And even though you can see from the photos that she made it in a large 6-Quart Slow Cooker, I think this Slow Cooker Banana Bread Cake with Brown Sugar Sauce from Averie Cooks sounds perfect to make in the Crock-Pot Casserole Crock Slow Cooker if you have one. I love the sound of this cake loaded with banana flavor for any occasion where you want a dessert you don’t have to watch that closely, or for summer when you want to “bake” a dessert without heating up the house! Get the complete recipe for Slow Cooker Banana Bread Cake with Brown Sugar Sauce from Averie Cooks. Averie made this in a 6-Quart Slow Cooker, but it would also be perfect to make in theCrock-Pot Casserole Crock Slow Cooker. Check out all the Slow Cooker and Pressure Cooker Dessert Recipes that have been featured on this site! I've never tried to "bake" anything in my slow cooker. Thanks for sharing this post; I think it will inspired me! Lydia, I think the Casserole Crock is perfect for "baking" in the slow cooker. I'm going to try low-sugar blueberry crisp this week!